Caryford Community Hall in Castle Cary (Maggs Lane, BA7 7JJ) is regularly host to a variety of gigs and talks throughout the year, with a recent focus on raising funds for the Hall's development. Here are details of two performances that are coming up in June. A Macmillan Nursing fundraiser by Simon Blake, the current king of the quirky, so get ready to discover "The Demise of Molly Philips of Exmoor", "Percy Grace Who Can't Play Bass" and "The Tentacled Menace of Lympstone". 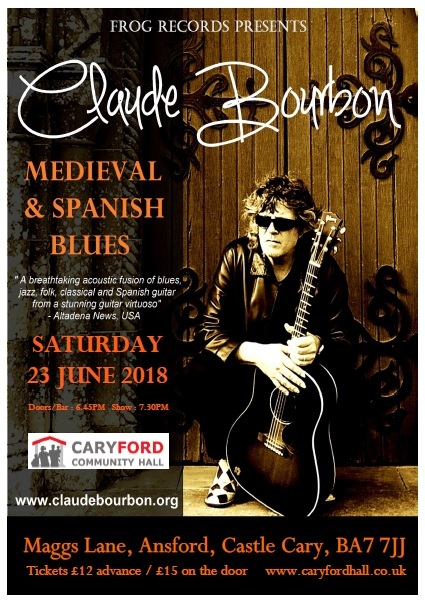 Anecdotes, comedy and the oddest of legends mixed together against a flamenco style guitar. Tickets £5. Call 01271 321 706. Doors open at 7:30pm. Cash-only bar. Free off-road parking. Claude Bourbon, known throughout Europe and America for his amazing guitar performances that take blues, Spanish, Middle Eastern and Russian stylings into unchartered territories. Tickets £12 from www.wegottickets.com/event/436535 or £15 on door. Doors open at 6:45pm, performance starts at 7:30pm. 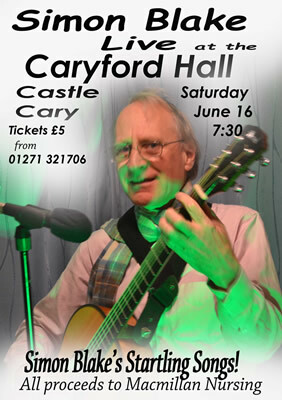 A Caryford Music Production raising money for Caryford Hall's Development Fund. Cash-only bar. Free off-road parking.